I’ve been looking into train travel in Europe and was very intrigued by it, but a little overwhelmed by all of the options. It was good to find this post so I can weigh my options easier and see what works best. Although getting a pass sounds like a great option for me. Thanks for all the info! If you are going to travel for a long time and visit different countries I would tell you to go by Eurail. Travelling with the pass is easy and you can travel on you own pace! One of the best things I have done in my travels is having a Eurail pass exploring Europe at my leisure. I’d love to do it again someday especially now that more countries are included. Back when I did it there were very few included in the pass which made it a little difficult at times but still worth it. I’d love to explore more of Eastern Europe next time. Our next Eurail adventure probably will be on Eastern European countries too. Or maybe we go up to Scandinavia, not sure yet!! I would love to go on a Eurorail trip. The main problem I have with that is that I live in Sardinia, and NO MATTER WHAT, I would have to fly to mainland Europe to catch the first train that takes me anywhere, blowing whatever budget I may have. 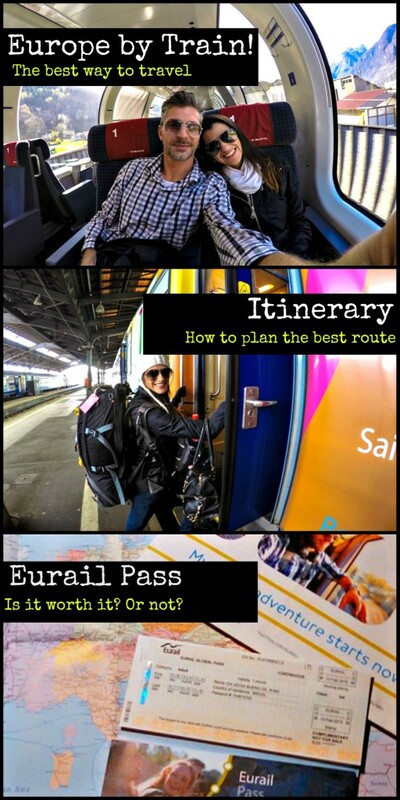 Excellent summary…I want to travel by Eurail! I´m sure you will have a great time exploring Europe by train! Travelling by train is such a relaxed and enjoyable way to travel long distance. Despite the crazy speed at times it’s so easy to watch and enjoy the amazing scenery outside your window while sitting in comfortable seats with good leg room and it’s so easy to move around and stretch your legs whenever you want. I’ve used the Japan passes many times although so far I’ve not used distances trains in Europe outside the UK I would definitely get a pass when we get to Europe for a longer trip. You are so right Toni, more space for the legs, bigger toilets and the possibility of a little walk during the trip, are some of the good advantages of train trip! I’m a big fan of travelling by trains! as you mentioned, train stations are usually in the city center, very easy to reach and no need to be there hours in advance! I’ve always wanted to enjoy an ‘interrail’ experience through Europe, but I’ve never had. This pass sounds very convenient, thank you for sharing! I´m glad you would consider travel with one of the Eurail passes, as you said it´s easier than flights. Especially if you have time enough to enjoy the long scenic trip! WOw, I was not aware of Eurail Pass. It seems great deal to travel around Europe, even though it is really expensive. Thanks for the useful information. Train is our favorite form of travel! So much great info here, thanks! We can’t wait to hit europe. We’ve been meaning to go for the last 9 months but smething new comes up in Asia that keeps us here a bit longer. Anyways, the photos you guys took are unbelievably beautiful! We cant wait to see! I´m so glad you liked the post! The Eurail Pass trips would be perfect for my kids who have an amazing obsession with trains. I´ve always wanted to do them too. Great post! Your articles are always so wonderfully detailed. Give a try to a good and scenic train trip, I´m sure you will enjoy. The high-speed trains are not so much fun, as they go way too fast and you can´t enjoy much the view. But the traditional ones are really nice! I’m glad that you found the tips useful!!! And enjoy a train trip with your kids, I´m sure it will be a great experience! Have fun and enjoy your tour Justine!!! The trains will be there waiting for you on your next Eurotrip! Thank you for sharing this information. I would definitely travel by train, as you get to experience more and see more. That ´s definitely true Trudi, trains are all about the experience! As you know, I LOVE train travel! I was very interested to read your post on this, but sadly it really doesn’t seem all that cheap does it… it is the same problem on trains in many developed countries. It is now so much cheaper to fly! Definitely the Eurail Pass is not the cheapest option for travelling, but I would say it’s worth the investment. Especially for a one month trip. The Eurail Pass is for non-European citizens. I have been to Europe a few times, but have always been scared off by the train prices. However, I think I will use a Eurail pass the next time I go and I have your guide to help me plan! Happy to hear that Tracie!! I’m a big enthusiast of trains, and I´m sure you will love to explore Europe by rails! What a fab way to travel! There is something about knowing you are crossing a country by land, taking in the culture and the scenery as you pass through landscapes that you would have otherwise just flown over. I went on an interrailing trip a fair few years ago (about 9 actually, but shhh don’t tell anyone!) and it was absolutely fantastic. Loved it. Just a shame it’s not the most affordable option. Great post with great photos :). I have to agree with you the feeling of arriving in a new place by land is completely different than by air! Glad that you liked the post. As you said it´s not the most affordable, but it´s a unique experience! That´s true, 3 months pass!! Our next train adventure around Europe might be with it! We just did a ten day Global Pass with Eurail and found it very convenient for all the reasons you mentioned. I’m working on my blog post about it now, but I’m pretty sure that we ended up getting good value for money from it, based on the routes we took. We did get caught out a few times, especially in Italy, where we couldn’t get anyone at the station to give us tickets using the pass, or we couldn’t work out if we needed a reservation etc. But we just got on the trains and worked it out from there. Was very convenient! I´m glad you had a good time with Eurail! And you are right, Italy is one of the most annoying countries to travel with Eurail Pass. Waiting to read your post and experience!! The fast and direct trains can be expensive, but you can find cheap routes and enjoy the journey around the old continent! One of my greatest travel dreams is to explore Europe through the Eurail– you know, just sitting there, enjoying the moment as I watch the amazing European scenery from my window. 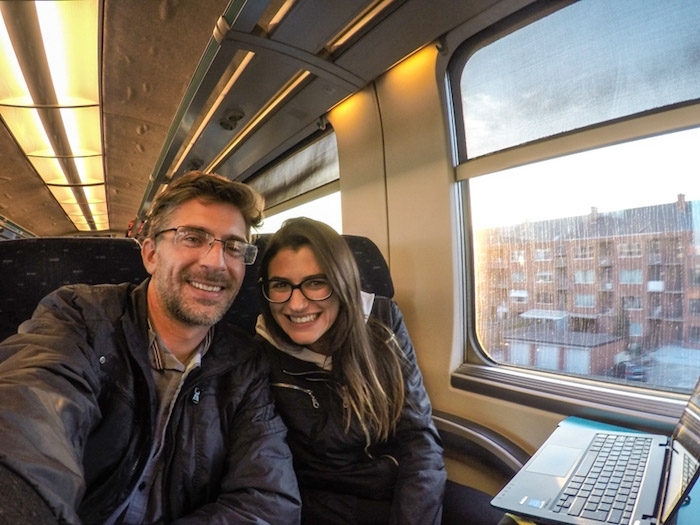 Looks like you had an amazing experience with the Eurail! I can only hope the same for myself. 🙂 Thanks for sharing! It´s a unique experience for sure!!! Your post is quite useful in planning euro trip.. thanks for sharing. You are welcome! What we liked the most is the freedom the pass gives to you. Awesome post! So informative & good to know since we are trying to work out our options for a trip next year but with 2 small kids in tow. That´s can be a money saver option! I love travelling by train, so this really sounds appealing to me. Also love the flexibility, although the app is clearly crucial too. And you can’t beat first class…..
I’m at a point right now (ie-poverty) where the cheapest option always wins out, but if money were no object I would spend all the time I could on the trains! But it was worth it, Europe in summer is always good fun and I don’t regret travelled by train, was an amazing experience! I’m with Brooke, I’ve always felt overwhelmed by the options but now it seems much simplier. I’ll definitely look at getting a pass next summer. I’m happy that we gave you some useful tips! Go for a monthly (or 3 months) Eurail Pass, I´m sure you will enjoy the rides! 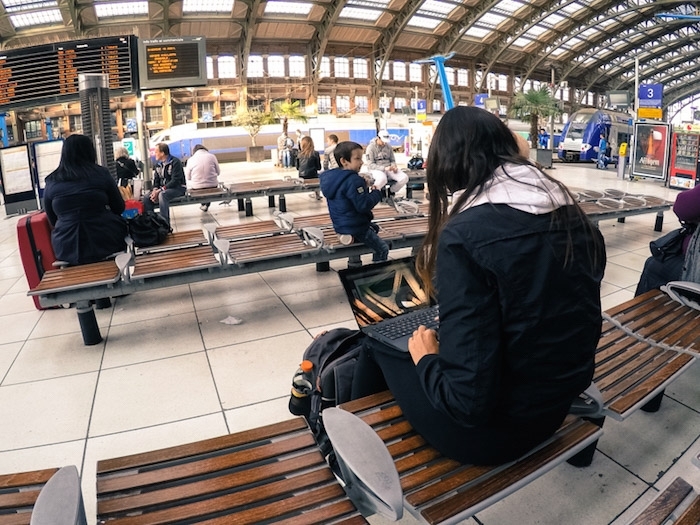 I enjoyed traveling via Eurail to all the European capitals first because I love train travel, going to beautiful stations and getting in and out of the central areas very quickly. That is one of the greatest things about travelling by train, usually you arrive in the heart of the city. Easy and Practical! I’ve done eurailing/interrailing twice in Europe. The first time it was around Scandinavia for one month, and another around Benelux for a week. Totally loved it and would highly recommend it, especially if one has time to spend and would like to explore many places/cities in one go. In addition to your points above, I also love the fact that you can travel right into a city centre, step out of the station, and start exploring the city right away. The scenery whilst on the road (or rather, train) is a plus too especially if you travel along the scenic routes like Oslo-Bergen, something which you can’t enjoy if you fly. Also, overnight travel might cost slightly more but don’t forget that you would have already saved on accommodation too. Glad to know that you had a great experience travelling with Eurail! On our next adventure by train, we want to explore the Scandinavian region, the landscape is stunning there, perfect for long train journeys! Your easy-to-understand tips and explanations were very helpful, and perhaps someday, they will come in handy for me! Glad that you found the tips useful! Europe by train is definitely a great experience..
Craig and I heading home via Europe in 2016 so this pass would be ideal for us. I did a spot of inter-railing when I was 19 with friends around Eastern Europe, they sure did not have an app then! Handy post, I’ll bookmark to refer to. I did an interrail trip in 2002 and things were much cheaper back than and I was much younger – especially under 26. I was 20 back than so the tickets were cheaper. I went from Vienna via Köln to Ostende (bc the TGV through the Eurotunnel was already very expensive back than), took the ferry to Dover, train to London and later to Bristol, Swansea and the ferry to Ireland (Rosslare) and travelled through Ireland, Northern Ireland, Scotland and England for, all in all, 4 weeks. It was amazing. Did you stay in hostels? B&B or something else?? Thanks for stopping by Eva!! I´m sure you had an amazing time travelling around UK and Ireland (I love Ireland). Your blog on Eurail was very informative and the fact that we get free candies in German trains, just perfect! 🙂 We can’t wait to read more of your travel tales! 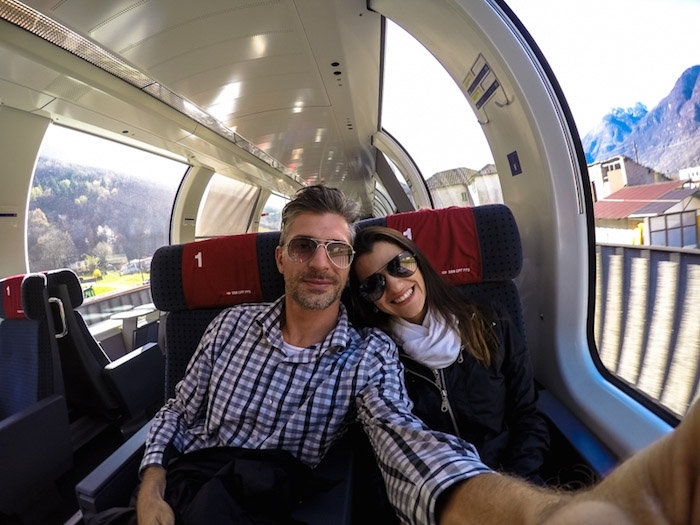 So happy that our post helped you to travel with Eurail! Great! We loved our experience travelling with German trains. This information is just what I have been looking for! Thank you. I am planning a 1 month holiday to Europe and think the Global pass is the best option by far. With your accommodation did you pre book it before your holiday or just as you got to each destination? Our trip with Eurail was smooth and easy. The only things you have to plan ahead are the night and fast trains. Otherwise is just get in the train and go! About the accommodation, we booked everything in advance. In Europe you can get better prices and even some discounts booking before your arrival. For us, a couple, we found great deals using Airbnb to book a room or even a studio (cheaper and more comfortable than hotels, for example in Paris and Barcelona). On our homepage there is a banner where you can get 20 usd discount on your first booking. Click there and sign up so you can start your trip saving some bucks. Also, we recommend you to look at Booking.com (here is the link http://tidd.ly/8004ba86 ) for us they have the best deals on hotels around Europe, also a reliable and safe company. Have you already bought your Eurail Pass? Hey Nat! Thanks once again for all the usueful information. I havent booked anything yet as I am not looking at going until around August/September next year! Im just gathering info and doing some research to start off with! So you will help us keep the blog running! Thanks, and if you need any more info just let me know! Natalie, thank you so much for this post it really helped me decide Eurail is the option for me. 1) London is not covered by the Global Pass 🙁 do you know what would be the best way to get there? (And chesper way too) I read you didn’t go there but I was wondering if you heard someone having that issue. 2) I am concerned about booking the hostel, hotel, etc on time. I would like to have flexibility but I don’t know how cheap and accesible would be to book a room someone on the same day you arrive to the destination, or with a few days in advance. How did you guys managed that? I don’t want to have everything booked in advanced in case we decide to change plans aling the way. What would you recommend? I’m glad to help! It’s a pleasure to share travel tips! 2º) Most of the hotels, hostels and apartments that we´ve stayed during our train trip were booked 1 or 2 days before the check in. When we arrive in a destination we discover what to do & see and kinda planned how many days we would need. One day before departing to the next place we´d book our rooms. We always use Booking (http://www.awin1.com/awclick.php?mid=5780&id=220241), they have many options and good last minute deals, so you won´t have problem to find a place. For hostels, Hostelword is the best (http://tidd.ly/22dd58a9). Depending on what type of room you choose these companies will allowed you to change dates without loosing money 😉 It´s a perfect option for an open plan travel! Hope I answered your doubts!! Have you already bought the Eurail Pass? Question: transportation during the stay in each city/country. I know most of our trip we will walk to one point to another but I also know some distances are crazy to go by foot. What is the best way to use transportation is the cities you visited? Buy as you go, cards that you pay and includes several options like bus, tram, train etc? Paris, Brussels, Amsterdam, Rome etc. Good that I could help you a little bit more! Once a while they announce sales for some types of passes, but we never know in advance. Would say to follow them on Facebook so you can see all the Promotional Updates. Also I would like to ask you a favour, when you decide to by your Eurail Tickets please do it through the link in this post. The link will take you to the official website of Eurail and you are going to pay the same price, but we get a small commission over your purchase. That´s how we can earn some money and keep the blog running. 😀 Tks!! Most of the time we purchase public transportation pass. Not the tourist one that include museums and attractions. We buy the simple one for 2, 3 or 4 days, it all depends how long we are planning to stay in a place. For example, in Paris is worth to buy the booklet of 10 tickets for metro (cheaper and you can cross the whole city). The same happened in Amsterdam, as we knew we are going to explore the city (and the city is quite big) we search the best ticket option for public transportation on the city´s metro website. Most of the time, the best option is the multi pass that includes metro, tram and buses. We avoid taxis, they can be expensive, you can get scammed and will spend precious time on the traffic. Around Europe Google Maps for public transportation works pretty fine calculating the best routes and timetables. Ahhh, depending on where you planning to go we have many articles about Portugal, Spain and Turkey, they might be helpful to you! If you need any for info send me an email! I used my first Eurail Pass back in 1974 – it was for 3 months. It was fantastic. Now I’ve retired, and next year will be the 4th consecutive year we’ve had a 3 week European holiday using the 15 day Global Continuous Pass. The extra days are where we start, and where we finish. I don’t understand why you say it’s expensive. We get 3 weeks with our Pass for half the price we’d pay on a tour. And without the disadvantages and with all the advantages. I love planning the route and researching where to stay and what to see. No way I come home and can’t remember where we went!! And I forgot to say – we never pay any extra for our trains either. Sometimes we choose to pay for a particular scenic route (€1.50 doesn’t break the bank!). And sometimes you can reserve a seat for free if you are in the country (e.g. Norway and Poland). French and German local trains are just as fast as the ICs, they have First class, and they are on time! So nice that you have travelled a lot with Eurail Pass, and always have a good time with them. We loved our experience too! We say that the Eurail Pass can be expensive if you compare with low cost flights around Europe. For sure the flights won´t have all the advantages and comfort as a train trip, but they can be really cheap, especially if you get lucky with sales. So for backpackers or budget travellers Eurail might not be the cheapest option for discover Europe. Thanks for commenting Anne, wish you all the best! It was hard for to get used again with low cost airlines. After good experience with Eurail Pass it’s difficult to travel without space and comfort again. Hope you have a great trip with your kid, I´m sure will be great fun for him! 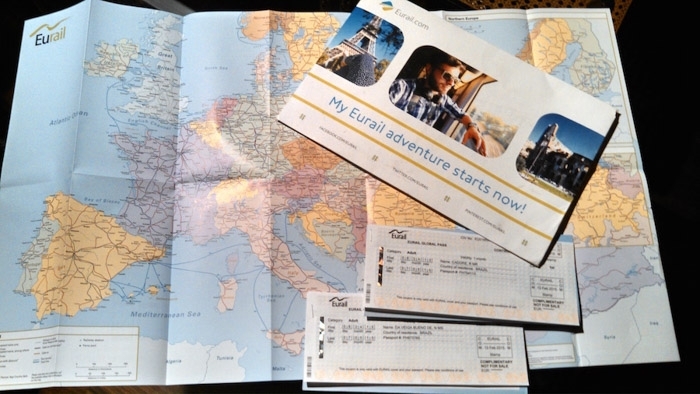 I have used Eurail passes on two separate journeys through central and eastern Europe. I wouldn’t have done it any other way! Travel by rail is THE best way to experience the country, and first class provided the extra comforts that made my journeys so much more enjoyable. Thanks for bringing back some wonderful memories! I have to get back there and do it again! All the best and safe journey! Great tips, we’ll be travelling by rail in Europe throughout November to January so will be sure to bookmark this post. Have a good time Lyn!! It will be winter so the landscape will be perfect for a train ride! This article was very helpful. Thankyou! I´m glad you liked it! We tried our best to put as much info together as possible. So people could enjoy travelling by train in Europe as we did! My strong preference is to experience Europe and the British Isles by train. These are just not the same from a plane and it’s a lot less hassle. Moreover, some rail routes are destinations in themselves, such as along the Rhine, in Switzerland, along the French Riviera, some routes in Norway, etc. Would like to emphasize what you mentioned about country and regional passes. These can really save money if travellers are focusing on specific areas. They should also investigate a combination of these passes and regular tickets. Thanks for stopping by Don! Glad to know that we have the same perception about how enjoyable is travelling by train! As you said, the journey itself is the fun, and every moment in the train or catching it is great. You gave me a great idea: French Riviera sounds like an amazing place to explore by train. Maybe on our next stop in Europe!